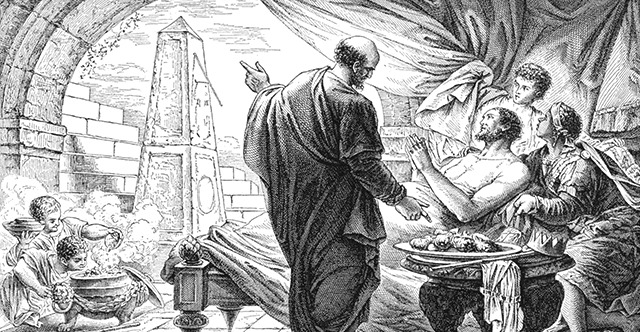 1 In those days Hezekiah became sick and was at the point of death. And Isaiah the prophet the son of Amoz came to him, and said to him, "Thus says the Lord: Set your house in order, for you shall die, you shall not recover." 2 Then Hezekiah turned his face to the wall and prayed to the Lord, 3 and said, "Please, O Lord, remember how I have walked before you in faithfulness and with a whole heart, and have done what is good in your sight." And Hezekiah wept bitterly. 4 Then the word of the Lord came to Isaiah: 5 "Go and say to Hezekiah, Thus says the Lord, the God of David your father: I have heard your prayer; I have seen your tears. Behold, I will add fifteen years to your life. 6 I will deliver you and this city out of the hand of the king of Assyria, and will defend this city. 7 "This shall be the sign to you from the Lord, that the Lord will do this thing that he has promised: 8 Behold, I will make the shadow cast by the declining sun on the dial of Ahaz turn back ten steps." So the sun turned back on the dial the ten steps by which it had declined. 9 A writing of Hezekiah king of Judah, after he had been sick and had recovered from his sickness: 10 I said, In the middle of my days I must depart; I am consigned to the gates of Sheol for the rest of my years. 11 I said, I shall not see the Lord, the Lord in the land of the living; I shall look on man no more among the inhabitants of the world. 12 My dwelling is plucked up and removed from me like a shepherd's tent; like a weaver I have rolled up my life; he cuts me off from the loom; from day to night you bring me to an end; 13 I calmed myself until morning; like a lion he breaks all my bones; from day to night you bring me to an end. 14 Like a swallow or a crane I chirp; I moan like a dove. My eyes are weary with looking upward. O Lord, I am oppressed; be my pledge of safety! 15 What shall I say? For he has spoken to me, and he himself has done it. I walk slowly all my years because of the bitterness of my soul. 16 O Lord, by these things men live, and in all these is the life of my spirit. Oh restore me to health and make me live! 17 Behold, it was for my welfare that I had great bitterness; but in love you have delivered my life from the pit of destruction, for you have cast all my sins behind your back. 18 For Sheol does not thank you; death does not praise you; those who go down to the pit do not hope for your faithfulness. 19 The living, the living, he thanks you, as I do this day; the father makes known to the children your faithfulness. 20 The Lord will save me, and we will play my music on stringed instruments all the days of our lives, at the house of the Lord. 21 Now Isaiah had said, "Let them take a cake of figs and apply it to the boil, that he may recover." 22 Hezekiah also had said, "What is the sign that I shall go up to the house of the Lord?"